Congratulations on BIP. IR pictures interest me. They have such a differnet feel to hem. Congratulations on a very much deserved award! Zeev I have just found a site that displays over 1500 IR images. The owner states they are not his but wants to share them with the public....please check to see if yours are on there. Please email for the site link. My email is in my bio. I've figured out the swapping of the blue and red channel - but I hadn't though about combining layers or using the hue slider - thanks for pointing me in the right direction! This is another lovely, colourful shot! Yes - I can see how this got BIP. Zeev, you are BIP. Your picture reveals an infinity of textures and an excellent use of the field depth. If you want to enter in the suitable forum it uses the version in English (a superior button exists to the right). Congratulations once again. Zeev my dear friend congrats i am a little late as always,u deserve the best,love,Subhash. My friend...sorry for being out of circulation for a while but I have been some kind of busy with my job and it will last through this week. This well deserved BIP is indeed stunning, and couldn?t wait a week without a comment. Zeev, my true congratulations for your award, really well deserved, fantastic photo!!! A nice filter when u need it .. So beautiful! These colours look amazing, and the mood is so special and original! personally i would crop out the wall in the bottom left corner. Wow! Zeev, what a great color! It looks like night time in a park... You did it really wonderful. Very nice, a very good job with the Cokin. A very sharp picture. Very well done Zeev! congratulations my friend!I send happy thoughts to you!Very nice indeed! Congratulations on you BIP award, excellent and full of beauty! Congrats for the BIP, well done. Haven't tried IR yet I like to shoot some images that way. I like this one. Excellent composition. Congradulations on the Best in the Project. Congrats my friend...you did it. Another one to add to my favourites! Superb work and congratulation for BIP! Cheers Zeev. what a superb work, my Friend! CONGRATS for the BIP Award!!! congrats on that. well captured and well deserved award. Excelente imagen! Atractivos colores en esta estupenda composición. ?Qué más puedo agregar a esta tan bien y justificadamente galardonada foto? P.S. : Gracias por tu amistad. Excellent!This one is better than previous one. I like it a lot!Fantastic colors! WOW, congradulation on being best in project, certainly well desired for this stellar beauty, well done my friend. Very interesting surreal image by the IR. Keep experimenting. FELICITACIONES POR BIN MERECIDO PREMIO!!!! Por favor, ?Puedes enviarme esta foto con los colores originales a mi e mail para ver como salen sin ninguna manipulacion en editor??? Es increible como un leve cambio en el espectro visible pueda alterar de tal modo nuestra percepcion del entorno conocido y memorizado a tal punto que no seamos capaces de reconocerlo. Excelente trabajo Zeev. 7+ Saludos afectuosos. Katiuska. Congrats on your award. Well deserved. Excellent photo. Del. Congrats on BIP Zeev. Great compositon and colours outstanding. Good work, Zeev. Congratulations for the "best" ! 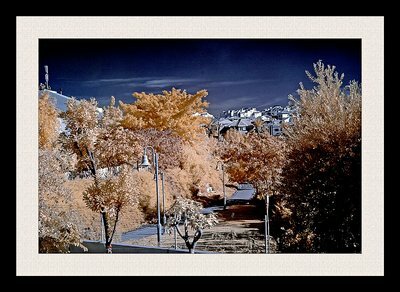 Wonderful 'otherworldly' and mysterious infrared photo, Zeev! I love the way the buildings in the background stand out! I find the frame a little heavy, but the image is great! Que puedo decirte...es extraordinaria!...bueno y no solo lo pienso yo, ya que ha sido premiada...Felicitaciones!.. Bueno te cuento que estoy tratando aún de conseguir el filtro que me sugeriste...pero no lo pude obtener...pero ya va a llegar!!...ja..ja.. Congrats for the award. Creative and artistic image. award, it is well deserved. Zeev, congrats for BIP, really well deserved, it's really awesome. Gongratulations Best In Project...Kind regards...Riny. It's difficult to comment on a BIP other than to congratulte you for it and let you know that you deserved it. Thank you for your friendly coment on my "Riding lesson". I'm glad it brought back fond memories. Congratulations, Zeev! A well deserved award for the beautiful IR shot. Amazing! I love the looks of this! Wonderful photo, and congratulations on best in project!! Excelente zeev, buenísima. Esta etá mucho más equilibrada. Zeev! Congrats for the BIP. This is fantastic work! Amazing!This IR pictures are fascinating.and I like the effect. Beautiful picture Zeev and CONGRATS on your BIP, you had it coming!! Excellent IR, Zeev, and congratulations on you BIP award! this afternoon i have see this one.. but for the time my comment is now! Really a cool shot.. very nice effect!! Congrats on the BIP also!! Very well done and executed! congrats with your best in project ! Ohhhhhhhh yes!!! Fantastic image my frind! I love these tones much much better! Congrats on a well deserved BIP! Hey My friend.. you got BIP.. congatulations!!!! .. and awaiting for new works! best regards..
Super job Zeev, excellent IR. Congrats on BIP. Amazing tones and colour. It has another athmoshere when you used IR filter. Excellent work!Congrats! Marvelous and congrats on the best in project. I can see why. Congratulations on the award Zeev. Well deserved. I like this wierd atmosphere! Keep showing us more! Strange but strong. Gives the feeling of a collage, I don't necessarily like the colors, but I must admit that there is probably a lot of room for experimenting with your filters. After all you don't have to agree, it's a matter of pure taste, and mine is not very developed, obviously. Wonderful and otherworldly, Zeev (if that's a word). Love the way the road winds through. Keep exploring, you're on the right track. I have no idea about what you're doing, but I can see with my eyes..and I see a very special image...with great depth and colours. Surreal...mystic... just great! Very good! The details and lighting are awesome. The IR effect gives this image an other worldly look. Extraordinary colours, Zeev ... great work! greta capture zeev - excllent woprk with the colours! Excellent work Zeev, I love these IR shots, I am not sure what I need to do with mine to get a similar result ? Very moody sky. Wonderful, but I think I actually like the other one better. It's more dreamy I think. wow. great IR. I Love this effects with IR.